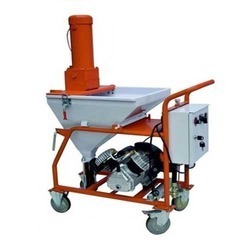 Our product range includes a wide range of Plastering Machines such as Plaster Mixers, Plaster Spraying Machine, Automatic Plastering Machine, Spray Plastering Machine, Mortar Spraying Machine, Rendering Machine and many more items. 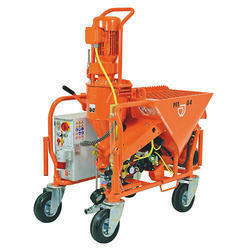 Taking quality as our prime concern, we are engaged in offering Plastering Machine to the customers. Backed by a team of experts, these are processed using optimum quality material and advance technology. 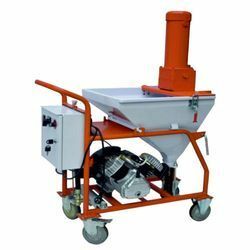 Furthermore, this Plastering Machine is availed in high strength and quality as per the varied demands of our valuable clients. Moreover, our clients can avail this product from us at industry leading prices. We have carved a niche as the most prominent organization in this industry due to our commitment to the timely delivery at any part of the country. 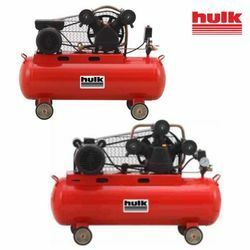 We are highly engaged in offering a wide array of Plaster Spraying Machine to our respected customers.These machines are available in various capacities and designs. Used to Spray: interior & exterior building wall sprayer cement slurry, cement mortar & Gypsum plaster etc. 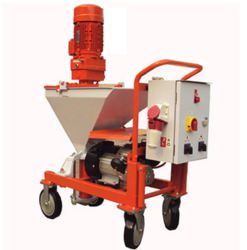 We are engaged in offering Automatic Cement Plaster Machine to the clients. Owing to our vast industry experience and depth knowledge of this field, we are involved in offering an extensive array of Plaster Mixers to our esteemed customers. The offered array of plaster mixers is executed by the highly skilled and well trained professionals in compliance with the global quality standards using finest grade basic components. 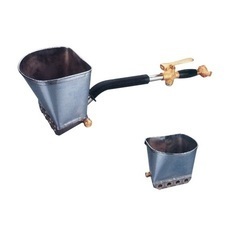 Moreover, one can avail these plaster mixers from us at leading market price. Lokpal Industries know for supply of wide range of construction equipment is now pleased to offer.Manufactured by world renowned KNAUF PFT GMBH & CO. KG - Germany is existence since 1964, the machine has been found very useful with Buildings and Contractors.We are a manufacturer of building site equipment, such as plastering machines, pneumatic conveying equipment, horizontal screw mixers, batch mixers and conveying pumps. 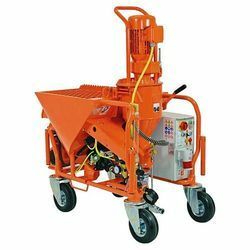 The majority of our machines is designed for the use of factory blended dry premixed mortars on gypsum or cement base, but we also have machine possibilities to handle pumpable building site mixtures. Since 1964, Knauf PFT GmbH & Co. KG, have been producing and selling our PFT pro-gramme. We are helping companies to plan and the machine has been designed to work economically and to rationalise their building sites which in turn will save costs. Of Europe’s No. 1 plastering machine, PFT G 4, have sold more than 100,000 units worldwide.The characteristics of a PFT machine include high performance, silent operation, sturdy construction, easy handling and the ease of transportation. PFT machines outstanding performance, permanent innovations and continuous developments help us to obtain a leading position in the market.With centralised production facility in Iphofen Germany, they have successfully exported machine programme to more than 100 countries.We are offering of Automatic Plastering Machine. Plastering, Fireproofing, Self Leveling Floor Screed; Brick Laying, Tuck Pointing, Joint Filling, Injecting, Pressure Grouting. 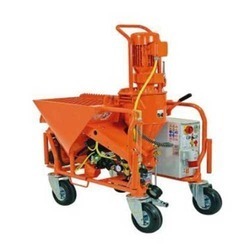 Furthermore, we would like to advise you, our machines process premixed dry mortars that can continually be mixed with water and can be conveyed with a rotor/stator pump. The minimum setting time has to be 30 minutes and the maximum grain size should not exceed 4 mm (mixing pumps) or 8 mm (conveying pumps). We also offer machine system solutions for job site mixtures. On April 15, 2013, our launched principal new mixing pump PFT G 4 next generation. With more than 40 years of experience in the construction of mixing and conveying pumps as well as ideas of users have influenced the PFT G 4 next generation. We worked closely with plasterers, painters and building contractors, to understand their needs and expectations from the existing PFT G4. With their valuable feedbacks we designed the new PFT G4 maintaining its strengths and adding more flexibility in working. so that our PFT G 4 remains the preferred choice of our customers. In short: the PFT G 4 next generation with all its advantages is a profitable investment for you and your next generations! Attached herewith is the brochure for PFT G4 Plastering machine. For more information on our products we request you to visit You can watch the PFT machines videos on you tube with a link provided on our home page. Masons with good skills of levelling techniques. We are an eminent entity engaged in offering an extensive range of quality assured Spray Plastering Machine. Offered machine is manufactured by utilizing innovative technology and optimum grade material keeping in mind the set standard. Our machines is quality checked on various parameters before final dispatch to clients. In addition to this, offered machine is available as per client's specifications in a stipulated time. 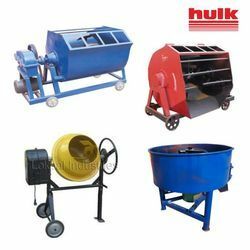 With an increased proportion of technology, we are involved in offering a high quality assortment of Mortar Spraying Machine to our respected clients. 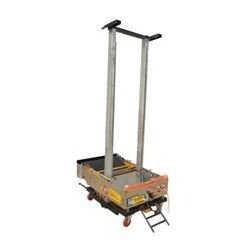 Manufactured by best industry experts using superior quality basic material and progressive technology, this machine is precisely design and developed by following advanced manufacturing concept as per the defined industry standards. We offer this machine in diverse technical specifications at the most economical market price to our clients. 600 Sq. Mtr./ 8 Hrs. 336 Sq. Mtr./ 8 Hrs. Being one of the established firms in the market, we are engaged in offering a highly effective range of Cement Plaster Machine to our clients. These machines are fabricated using best quality raw material to ensure optimum performance and optimum quality. Made as per industry laid standards, these are widely demanded by various industries for their features such as corrosion resistant and long lasting service. Apart from this, we are offering these products at nominal price range. 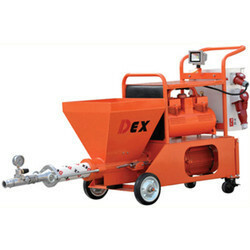 We are offering of Spray Plastering Machine. This a very convenient Hand Plastering tool, which is far superior to conventional plastering tools. It can give a plastering output of at least 5 times the normal. In just 1 hour a surface of more than 200 sft can be covered (12 mm thick), and 1200-1500 sft per day. Fill the hopper with mortar mixture with a maximum diameter of 3 mm of aggregate (narrow down sand), point mortar sprayer's mouthpieces to the wall and/or ceiling you want to cover from a distance of approximately 30 cm. Turn on the valve and the mortar mixture will be sprayed all over the surface adhering quickly to it. When the hopper empties, refill it again with mixture and repeat the procedure. Later, it will be necessary to pass a ruler (any object with a straight edge works) over the surface in order to level the mixture and give it the required finished. The suitable ergonomic design of MS15 allows its comfortable, simple and efficient use, allowing the work to be done Faster, Easier, Cheaper and with excellent quality. Keep a 20 litre bucket full of water where you are spraying. When the mortar sprayer is not in use, set it in the bucket and shoot a couple blasts of air to ensure that the ports are open and free of mixture. Twice a day, use a scrub pad and scrub off any mixture that has set. If you allow it to set longer, it will probably never come off. You can make different types of mixtures with a maximum diameter aggregate of 3 mm. 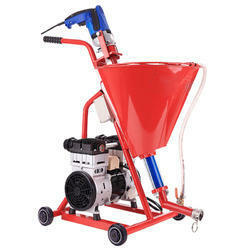 We are manufacture and exporter of Gypsum Plaster Sprayer. Application: High viscosity anti-corrosive coating, decorative putty, painting, glue, and for Gypsum Plaster with more than 30 minutes solidification time etc. Being one of the prominent and trustworthy organizations of this domain, we are involved in offering a wide assortment of Plastering Tools in the market. These are compact in size and widely acclaimed for their robustness, rough and tough usage and precise design. Owing to its optimum performance and precise design, these tools are widely recommended by clients. Apart from this, these are tested on various quality tests before the final delivery to the clients. We are leading Manufacturer of Surface finishing screed and our product is made up of good quality. 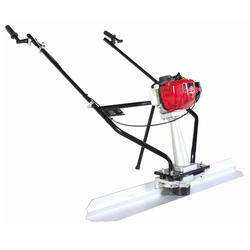 Looking for Wall Plastering Machines ?